Here is a simple but effective candle spell that can be used while entertaining guests as a centerpiece or even an altar and they won’t even know the blessings you are surrounding them with! This candle spell is easy and the earthy scents of the Condition/Anointing Oils will be mixed with the delicious aromas from your kitchen and your guests will not know that you are actually bestowing them with protection and best wishes for their luck and success. Clean candles as prescribed in right hand column labeled in Categories as “Proper Candle Preparation”. Let dry. 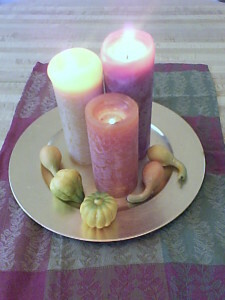 Carve three little holes/wells in candle top and add the “Fast Luck” to the cranberry red candle, the “Crown of Success” to the pumpkin orange candle and “Wall of Protection” to the golden spice candle. Arrange on something pretty like the gold charger I am using here. Decorate with leaves, mini pumpkins or even glass ornaments. I used faux mini squashes and gourds. Keep an eye on your candles while you are entertaining because if you use free standing ones as I have here, they will eventually distort and hot wax will run down one side. Extinguish with a candle sniffer before taking a post dinner nap. Enjoy this festive celebration and Give Thanks for all that the Universe has given to you.